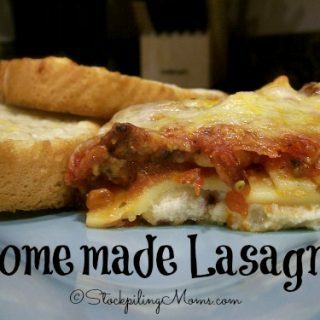 Homemade Lasagna is a such a great pasta dinner recipe! The sauce is made from scratch and the creamy filling is too good! Add noodles and cook for 8 to 10 minutes or until al dente; drain and set aside. Place pork and beef in a large, deep skillet. Stir in tomato sauce, crushed tomatoes, parsley, garlic, oregano, onion, sugar, basil and salt. Simmer over medium-low heat for 30 minutes, stirring occasionally. In a large bowl, combine cottage cheese, eggs, Parmesan cheese, parsley, salt and pepper. In a 9x13 inch baking dish, place 2 layers of noodles on the bottom of dish; layer 1/2 of the cheese mixture, 1/2 of the mozzarella cheese and 1/2 of the sauce; repeat layers. Cover with aluminum foil and bake in preheated oven for 30 to 40 minutes. Remove foil and bake for another 5 to 10 minutes; let stand for 10 minutes before cutting; serve.